The Consumer Protection Attorneys of Alex Simanovsky & Associates, LLC are dedicated to advocating on behalf consumers against the most powerful of entities: the government, insurance companies and auto manufacturers. You do not have to face your struggles alone. Alex Simanovsky & Associates, LLC represents victims of injury caused by the carelessness and neglect of others. Auto Accidents, Trucking Accidents, Motorcycle Accidents, Medical Malpractice, Worker's Compensation claim and all other tort claims. All injury cases are handled on a contingency basis, which means there is no recovery, there are no fees. 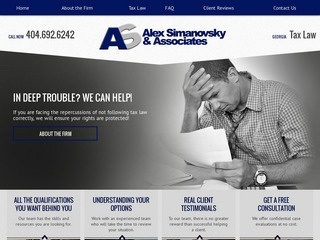 Alex Simanovsky & Associates assists consumers who are facing the nightmare of dealing with the IRS or Georgia Department of Revenue with back taxed, unfiled returns, payroll tax issues, audits and other matters pending before the IRS or GaDOR. 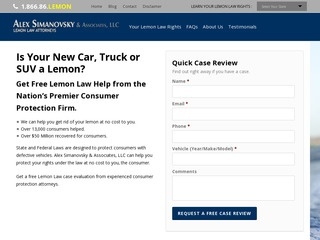 If your car, truck or SUV is a lemon, Alex Simanovsky & Associates, LLC can help you turn that lemon into lemonade. You may entitled to a refund, replacement or a cash settlement depending on your case. Under state and federal laws, if we are successful with your lemon law claim, the manufacturer must pay your attorney's fee. There are never any out of pocket fees to the consumer. 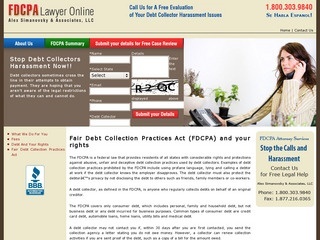 If you are being harassed by a debt collector, you have important right under the Fair Debt Collections Practices Act. The FDCPA is a Federal law that allows consumers to recover money damages from unscrupulous debt collectors. The law provides that you are also entitled to recover attorney's fees, so there are never any fees to the consumer. 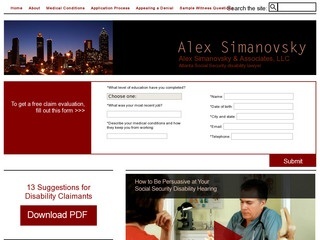 If you are disabled and have been denied benefits, Alex Simanovsky & Associate's Social Security Disability attorneys can help you appeal the denial and get you the benefits that you deserve. There are never any up front costs or expenses for our representation. We will guide you every step of the way to obtain your Social Security benefits. Attorney Alex Simanovsky has spent his entire legal career advocating on behalf of consumers against the most powerful of entities: the government, insurance companies and auto manufacturers. Mr. Simanovsky graduated with honors from the University of Georgia (Mathematics, 1992) and with honors from the University of Georgia School of Law (JD, 1995) and is a former chairman of the Consumer Law Section of the State Bar of Georgia. Alex Simanovsky & Associates, LLC has represented more than 13,000 consumers, helping them deal with important issues that affect their lives. The entire staff at Alex Simanovsky & Associates are committed to helping consumers with their legal issues and to provide personal advise to each of our clients.